This tree had some giant roots severed due to new construction being done. 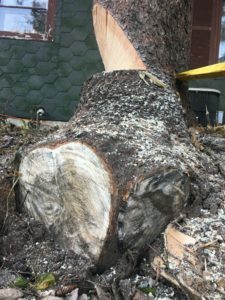 We received a phone call from one of our previous clients asking if we could remove the trees ASAP due to the concrete being poured the next day. Luckily, we were able to cancel a job and rush to the site so we could remove these trees before a brand new garage was sitting directly below them. Be sure to identify any trees that may be in the way when planning your new project!